Looking to buy an acoustic guitar for the first time? This can be a daunting task. In this article, you'll find out everything you need to know so you are well up to speed when it comes to actually making that first purchase. 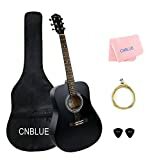 Do you want to get a best acoustic guitar for playing or learn to play and it have to look nice finish, good quality sounds? If so, this is a useful article for you, which give you some information’s about how to choose best acoustic guitar for beginners with best price! 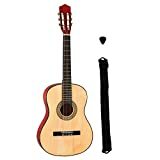 Choose the best or good acoustic guitar that mean you will not only enjoy great quality sounds and nice finish but also getting standard sounds. After all, you can play it for years after years, many great acoustic guitar made from all solid wood or top solid wood which better resonance so the sounds will improve for the age of your acoustic guitar. That is great features that you never find out with cheap acoustic guitars! If you are interested in how to choose the best acoustic guitars for beginners, read on! Why should you choose Acoustic Guitar? With several types of guitars out there to choose from, such as the enticing electric guitar, so why should you choose an acoustic guitar? They require less additional equipment than, for example, an electric guitar, which requires an amplifier in order to really play correctly. They aren’t as loud, in general, as an electric guitar. Your neighbors won’t complain! They are easy to learn and fun to sing along with. Many different styles of music can be played on a good acoustic guitar as: classical, jazz, blues, country, and more! This is one of the most important factors that have increased value of guitar. The best guitar always has a very nice and full rich deep sounds because it made by special solid woods only for acoustic guitar like Rosewood, Spruce, Mahogany, Koa, Maple. Some famous guitar brands has some models with very good quality sounds for beginners and students like Yamaha FG series, Jasmine of Takamine. 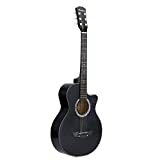 Additionally, an acoustic guitar with high quality sounds that help you recognize the tone quickly and ear for music better. You have never improved your guitar skills with “cheap” acoustic guitar sounds. It is very necessary not only for beginners but for guitarists. Easy to play is meant low action (the distance between strings to neck of guitar) so you can blend strings or press and play chords with easy and effortless. If you look a low price guitar and then a good guitar you will find out the big difference of finish. When you touch a good acoustic guitar from famous brands you will feel luxurious and exquisite in design. Of course, a nice finish acoustic guitar that encourage you practice and playing it frequently. May be your friends will “envy” when see your acoustic guitar too. So many no name brand’s acoustic guitar out there which ready for lie you and their customer about quality of guitar. It’s too bad when you have a mistake choice because you will not pleased with it for short period playing and then it may be destroyed your passion with guitar or pay more for another high quality acoustic guitar. With some big best acoustic guitar brands like Yamaha, Jasmine of Takamine, Epiphone, Gibson, Taylor, Ibanez, Martin, Fender, Johnson, Ovation, etc. You can completely set your mind at rest about that because you not only pay for warranty of quality but pay for guarantee for brand. Laminated wood vs. Solid wood: Generally, solid wood will produce sound better than laminated wood because it is not as nice resonant as solid wood. A guitar with all solid wood is so expensive and all laminated wood is not as good sound as solid wood. When combine of both, solid wood top and laminated back and side that will give better guitar with affordable price. Yamaha FG series, for instance, it is a best choice for beginners when combine excellently of both. Solid wood is best suit for top side which has the greatest impact on the guitar sounds. If the top side of acoustic guitar can resonate and vibrate nicely, the whole guitar will give good quality sound. Laminated wood is good for back and side because it is less be influenced by ambiend of humidy and temperature, so your guitar will be durable and flexible, you can play it anywhere from in a campfire to studio. Although the wood will appraise the quality sound of an acoustic guitar, but it does not mean that you only choose guitar made from quality wood, which is that all for good quality acoustic guitar. The value of best acoustic guitar depends on a lot of another things such as wood-treatment method, craftsmanship, guitar-building techniques, brands, warranty, guarantee and so on. For instance, all solid wood with Sitka Spruce top, Rosewood back and side but someone has only $$$ price and other has $$$$ price (Blueridge BR-180). You may also read this article https://guitarlisty.com/best-acoustic-guitar-under-200/ to know more about acoustic guitars for beginners. The size and body shape will influences both the sound and playability of an acoustic guitar. Choosing a right one that help you are more comfortable playing. It is much more similar to the traditional classical guitar in size and shape. It is smaller than dreadnought body and look like an hourglass body. The overall tone of it is well balanced through all the notes and it also deliver a clear tone and a strong voice too. Classic body is a favorite of those who love to play fingerstyle. It is most popular, known as “a standard” acoustic guitar body shape because of its versatility and most of acoustic guitar has this shape. The dreadnought is best for hard-strumming and flat-picking due to their great balance in the bass, mid, and treble ranges. It is largest body and excels as a rhythm big guitar, chords, plenty of voice and outstanding balance tone. Because of big body shape, it is not as flexible as dreadnought body. With cutaway style, you can access to the high frets easily on the guitar neck that good for people who want to play flamenco or solo with many upper frets. Non cutaway or standard guitar has full rich deep sound than cutaway but the difference is only little. If you are beginners, may be a standard acoustic guitar is better! Generally, bigger guitars will deliver louder volume. The size has a big role on the volume, however the overall design and construction of body has a greatest effect on tone than size or shape of an acoustic guitar. A good acoustic guitar has own unique sound and tone. Additionally, every model is provided with some additional or unique features which you can’t find out in the other. Why you do not buy any cheap and low quality acoustic guitar? The reason is the same any other produces, “you get what you pay for ”, if you buy BAD and cheap acoustic guitars you may get buzz sounds, limited using by the low quality and it will destroy your passion soon. That is the end of how to choose the Best Acoustic Guitars for beginners. It’s always a worry when purchasing a first acoustic guitar, but with this guide you are well armed to take your first steps into the world of guitar! Find out all about our latest articles, podcasts and lessons here on GMI – Guitar & Music Institute. Hi, This is John Anthony, I'm a blogger and a Musician/Guitarist at the same time. GET A PIECE OF THE PIE WITH GMI!